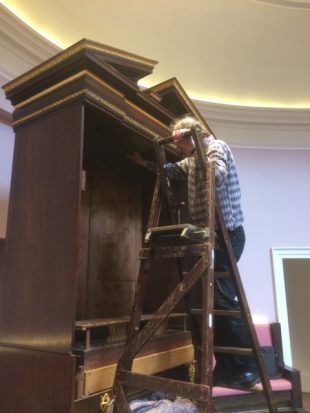 Dominic installing the chamber organ in St Cecilia’s Hall in the Edinburgh University Collection of Historic Musical Instruments. The organ dates from around 1775, and may be by James Jones, who was partner to John Snetzler at the end of his life. It was restored by Noel Mander in 1967 but splits in the bellows and wind chest as soon as it arrived at St Cecilia’s Hall mean that it has not been heard for 50 years – till now!